After decades of close-to-the-ground travel through Europe, Rick Steves has learned which Italian words and phrases are important for independent travelers — and which ones are worthless outside of four-star hotels. This pocket-sized volume is packed with practical words and phrases designed to help you enjoy a better trip. 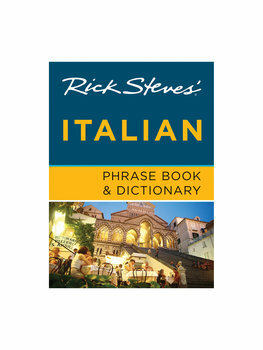 More pages than previous editions, but thinner paper for better "pocketability"
If your trip will focus primarily on Italy, this single-language phrase book is your best value. If you'll be traveling to French- or German-speaking areas as well, Rick Steves' French, Italian & German Phrase Book might be the better buy. It contains all the essentials of each single-language phrase book, but without a dictionary, and with fewer travel tips (and it's in two-color, not full color).